In my proactive search for cool hands-on science activities, I came across this blog post that explains (with free printable templates) how to make a t-shirt with a realistic drawing of human internal organs on it. While the kids already know basically what their heart, lungs, and stomach look like and where they are located, I thought this activity would be a great way to help them remember the names and locations of some of the organs they might not be as familiar with, such as the pancreas, appendix, and spleen. To do this project, I bought white long-sleeved kids’ undershirts, which came two in a pack and were less expensive than regular shirts. 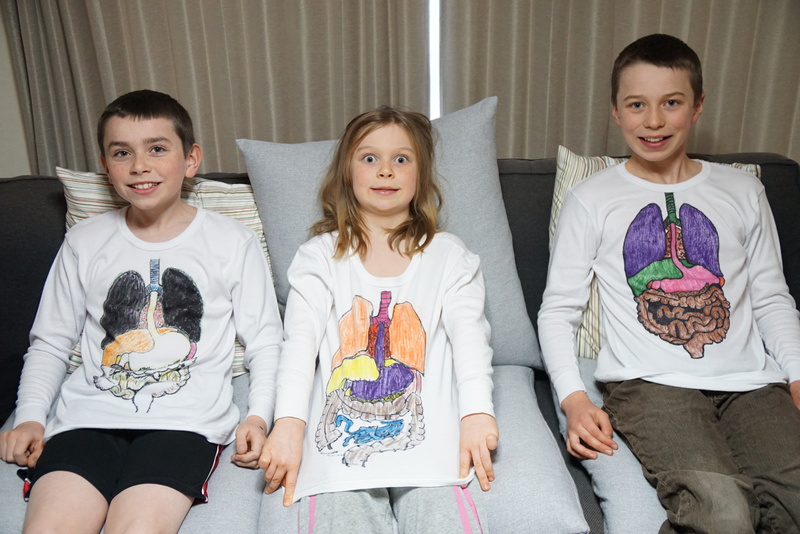 Since I wasn’t sure how excited the kids would be about going around town with their organs in full view, I thought they could just use them as pajama shirts or for wearing around the house (especially when we are doing science together!) The t-shirts could easily have been short-sleeved, but since it’s winter I thought that long-sleeved would be cozier. I printed out the templates from the website on white card-stock. The templates were two pages so I stapled them together to make the full picture. Then I inserted them inside the t-shirts so that the picture was where we wanted the drawing to be when it was done. The kids then used fine-tip black permanent magic markers to draw the outline of the organs. Since the card stock paper was in between the two layers of the shirt, it kept the pen from bleeding through to the other side. The t-shirt really needs to be white so that you can see through to the template underneath. This part of the project was a little bit tricky because depending on the light in the house it was harder or easier to see through to the picture on the template. Austin and Ethan moved around to different locations until they found a spot where they could see best. They also had to be very careful not to move the template if they moved the shirt so that the picture would end up in the right spots. After the kids finished tracing the organs the best they could, they used another copy of the picture that I printed out that had the organs labled (also from the same website). This helped them see where the different organs began and ended. They then colored the different parts their colors of choice using fabric markers and fabric crayons I had gotten on Amazon Japan. With both the markers and crayons, you have to place a piece of paper over the colored places and then iron it for a bit to make the color permanent when you have finished coloring. We all really like how the t-shirts turned out and they came in very handy when we were reading about digestion the other evening! When the book mentioned a certain body part involved in digestion, I had them find it on their t-shirt. We also used our science textbook’s description of where each body part is located to see if their t-shirts placed their intestines, heart, stomach, etc. in anatomically correct locations. They weren’t perfect (the amount of intestines is a bit less than in a real human body) but they were pretty close! All in all it was a worthwhile project that will hopefully help our anatomy studies “stick” in their brains better this year. Katie was actually so excited about her t-shirt that she wore it to school and showed it off to all of her friends and teachers! So, I’m calling this project a success! Austin starts the drawing process. It took a lot of concentration to detail to get the drawing right. Ethan worked really hard on this and took it seriously. Excited that their t-shirts are almost done. Katie finished drawing before the boys and started adding in color. Katie’s drawing with a little color added. Katie doing her “model” pose. Ethan in his newly finished t-shirt. Close up of Ethan’s shirt. Austin proudly posing with his finished product. Close up of Austin’s shirt. One of my goals for 2015 is to get back to blogging more frequently. Another is to make sure I include plenty of hands-on activities in our homeschool on a regular basis. I feel like the hands-on component of our school time has waned recently. It’s easy to feel like I just don’t have enough time to fit it all in. But reading blog posts like this have been reinspiring me to make sure we don’t leave out the fun stuff! We’re studying about the human body in science this year with the Usborne Complete Book of the Human Body as our base. It’s a fantastic book with lots of great photos, but it is still easy to have the content of the book go in one ear and out the other, especially when the topic is something complicated like DNA. 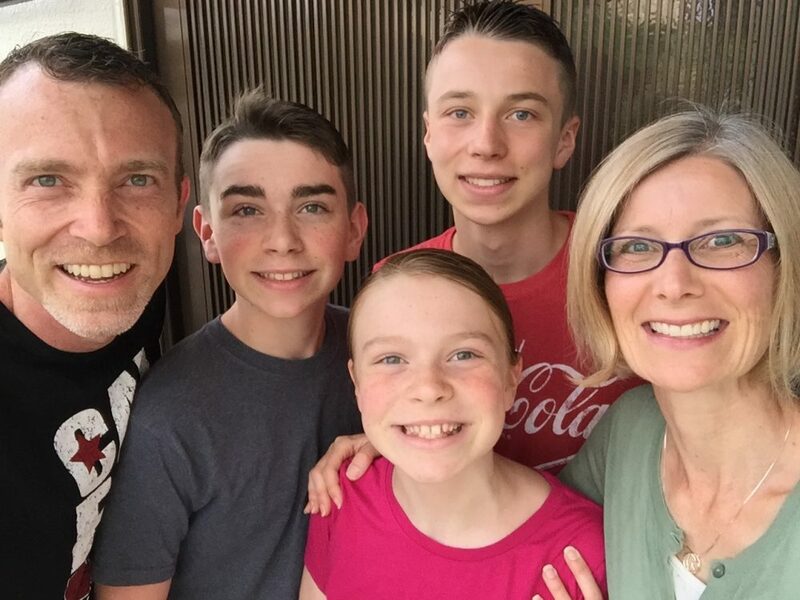 So, I decided to take a chunk of our day yesterday to first brainstorm together what we already knew about DNA and then watch several youtube videos like this that did a great job of explaining what it is and what it does. Then I let the kids make edible models of DNA out of Twizzlers and mini-marshmallows with this method to help solidify what we have been learning. It worked out great and we all had a fun time doing it! Now that the kids are getting a little older, the hands-on projects aren’t quite as chaotic as they used to be. My kids actually don’t like the taste of either Twizzlers or mini-marshmallows, so they still haven’t actually eaten their projects yet, but they turned out to be terrific materials to use! Yesterday’s success definitely inspired me to keep the hands-on activities coming on a regular basis again and I will be sure to write about them here. Here are some photos of our learning time yesterday. You can click on individual photos to enlarge them. The kids followed a specific genetic code that translated the four marshmallow colors into the DNA base pairs. Then they followed base paring rules to complete the other side. Katie is excited to start building! Neither of these items are easy to find in Japan. I had to borrow the Twizzlers from a friend and special order the marshmallows online. The first page of the instruction sheet we used. Goofing around his double helix. Bug parts, cheek cells, fabrics, leaves, hairs, paper scraps, drops of slimy pond water. These are just some of the ordinary-turned fascinating items that we have examined under the lens of our microscope so far this school year as part of our Sonlight science curriculum. It’s amazing how getting a chance to look closely at items we normally take for granted can elicit ooohs and aaahs from kids and parents alike! We also recently did a project where we made gelatin, added it to petri dishes, and then stuck our fingers in potentially germ-infested substances. We then poked our fingers into the gelatin to see what kinds of creepy microscopic organisms would grow! Gross stuff like ear wax, nose mucous, river water, dust behind the refrigerator, and more made it into our petri dishes. We also pushed a clean finger into one petri dish and in another a finger disinfected with Germ-X alcohol gel so we could compare the dishes that had been touched with something clean with the dishes that had been touched with something dirty. A week or so later, we got to look at all the dishes under our microscope. Wow! Exciting stuff! Since we’ve been reading about the structure of cells in our Usborne World of the Microscope book, we decided to make models of animals cells out of cake. A couple of years ago we did the same project with plant cells, but it was so much fun (and so delicious!) that we decided it was worth doing again. This time Katie was old enough to join in the fun and make her very own cell model all by herself. Science is one of our most hands-on topics and it gives a chance to marvel at God’s creativity, intelligence, and attention to detail so it is definitely a favorite around here! Katie was proud of her cell cake! Austin and Ethan building their cell cake. (Austin had a cold and in Japan people wear masks to protect others from their cold germs). Austin and Ethan are ready to eat their cell cake!! Austin and Ethan’s cell cake next to a model of an animal cell. Cell cakes and our microscope textbook.